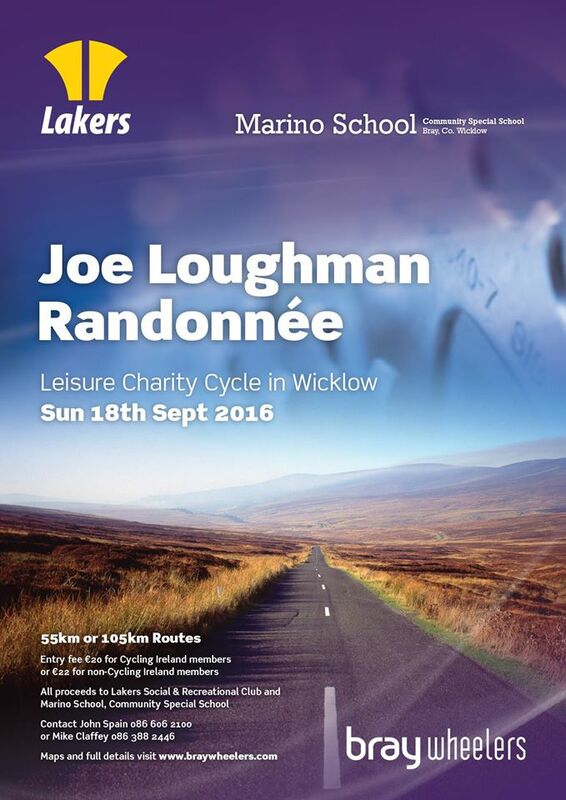 Long before cycling became the new golf, and years before the bike to work scheme introduced a whole new audience to our passion, the bicycle, Bray Wheelers ran the inaugural Joe Loughman Randonée. Now in its 17th year the annual event is held in the memory of one of the founding members and past Club President of Bray Wheelers, Joe Loughman and will take place in September 2016. Established in 1949, and one of the oldest cycling clubs in the country, Joe and others had a vision that still remains strong to this day with a club that caters for all cyclists, young and old, leisure and racer, in one of the most beautiful and challenging parts of Ireland to cycle. Bray Wheelers have a proud tradition of donating proceeds from the event to worthwhile causes and will soon announce the 2016 beneficiaries. The Randonée starts and finishes at the Bray Wheelers Clubhouse on Schools Road, Bray and with two routes caters for everyone. A 55km family and novice friendly route takes cyclists along the coast to Newcastle before heading inland for Ashford. Riders will then climb easy Devils Glen to Roundwood before tackling the Coach Road to the Old Long Hill and home via Kilcroney Lane to finish with well-earned tea and cake at the clubhouse. The challenging 96km route takes the same route at the 55km route as far as Ashford before then climbing to Garry Duff and onto Rathdrum. Climbing out of Rathdrum and descending into Ballinaclash, having turned right over the bridge, you’ll face the second big climb of the day. Turning right at the top for Greenane, riders will then turn left to tackle the famous Shay Elliott Climb at Drumgoff. On to Laragh for the well earned food stop , Roundwood and home via the Coach Road to the Old Long Hill, Kilcroney Lane and finish with tea at Bray Wheelers Club House. Sign-on will be from 8.30am to 9.30am in the Bray Wheelers Club house. Entry fee is €20 for Cycling Ireland members and €22 for non-Cycling Ireland members (to cover the €2 leisure one day licence) and riders are asked to note that this is non-mass start event. Helmets are compulsory, everyone is welcome, see you on the road!